Ex-pirate scum turned major league heroes? The Greenmoon Smackers bring a wealth of violent tricks and brute force to the arena floor in a spectacular demonstration of brawn over brain. 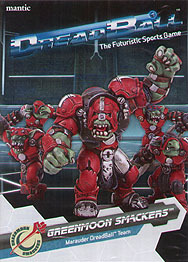 This set contains eight premium plastic marauders.